Beautiful Pure breed Amstaff pups for sale. Pups are loving, fun and family orientated. Males and females available. 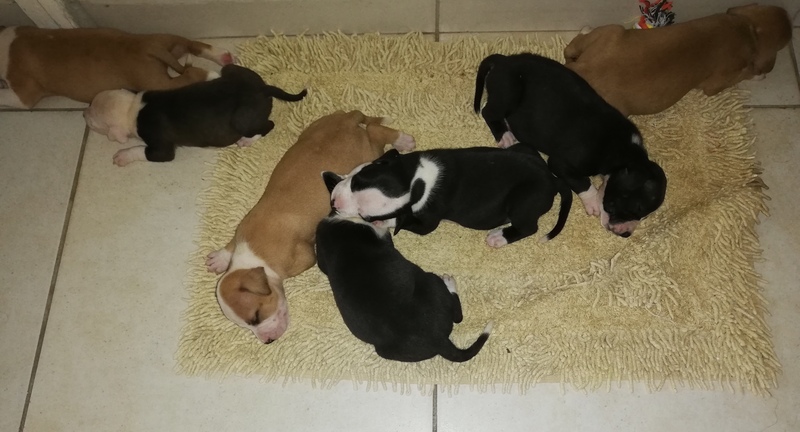 Pups were born 25/12/2018. Pups are dewormed and Vet checked. These healthy pups will be vaccinated at 6 weeks. Please call /whatsapp *removed* for more info and pics. Searching for GOOD homes. Staffie puppies are rambunctious little blocks of cement that will mow you right over while smiling the biggest, most gorgeous smile you’ve ever seen on 4 legs. They’re big and bulky enough to be called “real dogs” and small enough to be allowed in most complexes without an issue. But beware, these crazy little guys can JUMP! If your wall isn’t particularly tall, expect to find your baby roaming around the streets when you get home. The Staffie is the perfect Pitbull alternative for when you don’t have space for the real deal. Plus they come with almost none of the bad reputation the Pitbulls (sadly) get. Sometimes Staffies get abandoned by nincompoops. And sometimes they get rescued by organisations dedicated to rescuing these gorgeous little blocks of cement.